Article does not meet notability standards of Organizations and Companies: "An organization is not notable merely because a notable person or event was associated with it." The only references available for this mosque are in relation to individuals who attended the place of worship, not about the mosque itself. If you can address this concern by improving, copyediting, sourcing, renaming, or merging the page, please edit this page and do so. You may remove this message if you improve the article or otherwise object to deletion for any reason. Although not required, you are encouraged to explain why you object to the deletion, either in your edit summary or on the talk page. If this template is removed, do not replace it. The article may be deleted if this message remains in place for seven days, i.e., after 05:02, 25 April 2019 (UTC). If you created the article, please don't be offended. Instead, consider improving the article so that it is acceptable according to the deletion policy. Find sources: "Masjid Ar-Ribat al-Islami" – news · newspapers · books · scholar · JSTORPRODExpired+%5B%5BWP%3APROD%7CPROD%5D%5D%2C+concern+was%3A+Article+does+not+meet+notability+standards+of+Organizations+and+Companies%3A+%22An+organization+is+not+notable+merely+because+a+notable+person+or+event+was+associated+with+it.%22++The+only+references+available+for+this+mosque+are+in+relation+to+individuals+who+attended+the+place+of+worship%2C+not+about+the+mosque+itself.Expired [[WP:PROD|prod]], concern was: Article does not meet notability standards of Organizations and Companies: "An organization is not notable merely because a notable person or event was associated with it." The only references available for this mosque are in relation to individuals who attended the place of worship, not about the mosque itself. Masjid Ar-Ribat al-Islami is a Sunni mosque in San Diego, California, on 7173 Saranac Street on the San Diego-La Mesa, California border. 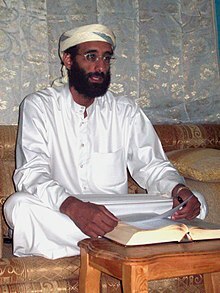 Anwar Al-Awlaki, who has been accused of being a senior Al-Qaeda recruiter and motivator linked to various terrorists, served as Imam of the mosque from 1996–2000. Two of the hijackers in the September 11 attacks (Nawaf Al-Hazmi and Khalid Almihdhar) regularly attended the mosque in 2000, and Al-Awlaki had many closed-door meetings with them, which led investigators to believe Al-Awlaki knew about the 9/11 attacks in advance. ^ "Thornton, Kelly, "Brief N.Y. hearing held for S.D. trio in terrorism case; Release possible after they testify before grand jury," October 3, 2001, accessed December 9, 2009". Pqasb.pqarchiver.com. October 3, 2001. Retrieved March 18, 2010. ^ a b c Schmidt, Susan; Imam From Va. Mosque Now Thought to Have Aided Al-Qaeda; the Washington Post, February 27, 2008. Retrieved November 20, 2009. ^ a b Thornton, Kelly (July 25, 2003). "Chance to Foil 9/11 Plot Lost Here, Report Finds". San Diego Union Tribune. Retrieved May 10, 2010. ^ "Eckert, Toby, and Stern, Marcus, "9/11 investigators baffled FBI cleared 3 ex-San Diegans", ''The San Diego Union'', September 11, 2003, November 30, 2009". Pqasb.pqarchiver.com. September 11, 2003. Retrieved March 18, 2010.